Low-impact aerobics allow you to benefit from aerobic activity sans the stress and strain on your joints and spine. Low-impact aerobic exercises call for large, controlled movements of large muscle groups. The movements are rhythmic. During the exercise, at least one foot is placed on the ground, which makes it easy and is strain-free on the tissues. This avoids sharp impact on joints and muscles that may lead to repetitive stress injuries. Low-impact aerobics are ideal for overweight people, seniors, pregnant women, or for those who want to protect their joints. Low-impact aerobic exercise increases the flow of blood and nutrients to the back which in turn supports healing. This can reduce the stiffness of the back and joints. Low-impact aerobics are perfect for people who wish to flaunt a toned shape. With time, the intensity and duration of the workout can be increased gradually. By following the routine, one can attain the much- desired physical fitness. Following a healthy and balanced diet is essential while following low-impact workout. There are several types of aerobic exercises that are gentle on the back. When done on a regular basis, they help condition the muscle and tone the body. Walking: Walking is a great low-impact exercise that is gentle on the back. Invest in a good pair of shoes and walk two to three miles three times a week is very helpful. Ensure that you walk on an even surface and that your foot does not hit the ground hard. Swimming: Another wonderful low-impact aerobic exercise is swimming. It uses large, smooth movements and works the whole body. All the muscle groups get worked out while swimming. 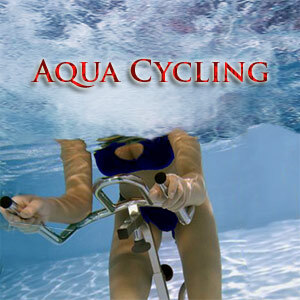 Many land exercises can be done underwater as it will take the stress off the joints. The stress is not felt because water supports part of the body's weight. Stationary bicycling: Stationary bicycling is another effective low-impact exercise. It works on the muscles of the legs and buttocks. You can choose from multiple programs that help you manage and change exercise pace, measure caloric burn and heart rate. Dancing: Low-impact dancing is also a form of low-impact aerobic exercise; as it involves smooth movements. Here leaping movements and plenty of hopping steps must not be included. Elliptical training with its gliding motion is a low impact aerobic exercise. The steadying movements of Pilates with steady trunk and movement of arms and legs is yet another example of low impact aerobic exercise. Most aerobics and dance workouts are low impact just as rollerblading, hiking and step aerobics. Seated workouts and gentle mat exercises most often work with your feet on the ground and are therefore low impact. You can add intensity to your low impact aerobic exercises by adding more upper body movements. You could swing your arms while you walk or choose machines with upper body options such as elliptical or skiing machine. Involve your lower body with lunges and squats. Pick up pace as you exercise to add power to your low impact aerobic activity. Weight loss sans stress on the spine and joints. Reduced episodes of back pain. Endorphins are released during the exercising schedule aiding pain control. Release of stress and renewed energy. High impact aerobic exercises are best for those who have a good fitness baseline. Though high impact exercises help better calorie burn, they also make you liable for injury to joints and spine. Jumping jacks, skipping and running are high impact aerobic exercises. Jumping and excessive pounding or force on lower body joints can cause stress on the knees and ankles. Pole exercises are an interesting twist to the aerobic routine. The exercise pole can be removed or secured at both ends (floor to wall). The pole stands several feet high. Pole dancing is both an aerobic and anaerobic workout. It helps in strengthening and toning the core muscles. Pole aerobics also helps in keeping up the heart rate thus ensuring a solid cardiovascular workout. Pole aerobics helps tone the arm, leg and core muscles. It also aids in calorie burn. Pole aerobics uses the body's own weight as resistance to create a highly fluid workout. Pole aerobics combines dance and gymnastics, making for fluid graceful movements. What was earlier seen as an exotic dance form is now an interesting aerobic exercise. Builds strength in all major muscle groups like upper and lower back, shoulders, biceps, triceps, calves, inner and outer thighs, core, hamstrings and quads. Tones the complete body in weeks. Improves motor skills and flexibility. Helps improve overall condition and flexibility. Choose to shed off the pounds with loads of fun - hip hop aerobics. 45-60 minutes of hip hop aerobics a day helps tones the muscles. Wear comfortable clothes that can absorb sweat. Ensure that your clothes aid free movement. Hip hop exercises draw inspiration from the music videos of 1980s. Body waves, isolation exercises and jumps are some of the basic movements in hip hop. Popping moves allows quick movement of muscles and a sudden stop. People with respiratory problems, heart problems or who have suffered any kind of injury should not attempt hip hop aerobics. Hip hop aerobics works towards developing strength, cardiovascular endurance and coordination. Hip hop engages plyometric moves thus enhancing fat-burning and building stronger bones. Helps maintain optimal levels of blood pressure. The anaerobic benefits include strengthening the thighs, glutes, calves and various other muscle groups in the arms and legs. First Published Date: 12 Jun 2012 Last modified Date: April 23 2019 This page may have been updated recently as new information is available or the content may have been edited for better readability.